November 5th (Wed) to 11th (Tue), 2003. At Takashimaya Department store Tokyo. 1957　Born in Nagano-pref. (August 26). 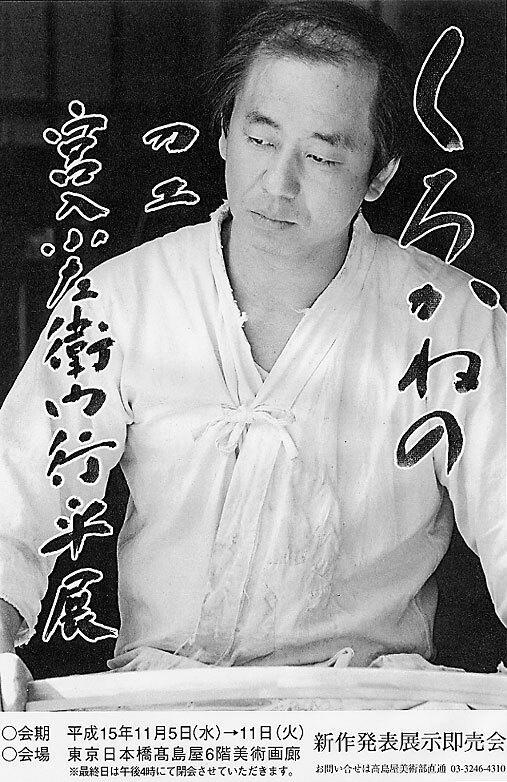 1977　Became a disciple of his father,Yukihira Miyairi(an Intangible Cultural Asset). 1982　Authorized as a qualified sword-smith by the Agency for Cultural Affairs. "Doryoku-sho"(prize awarded in recognition of efforts). 1984・85　Participated in the 20th,21st "Shinsaku Meito Ten" and received a "Doryoku-sho"
1986　Participated in the 22th "Shinsaku Meito Ten" and received a "Yushu-sho"(excellent prize). 1987・88・85　Participated in the 23th,24th,25th "Shinsaku Meito Ten" and received a "Doryoku-sho"
1990　Participated in the 26th "Shinsaku Meito Ten" and received a "Kanzan-sho". Held "Exhibition by Followers of Yukihira Miyairi, the Intangible Cultural Asset" in Tokyo. 1991　Participated in the 27th "Shinsaku Meito Ten" and received a "Mainichi Shinbunsha sho". 1992　Participated in "Shinsaku To Tenrankai" and received a "Yushu-sho". 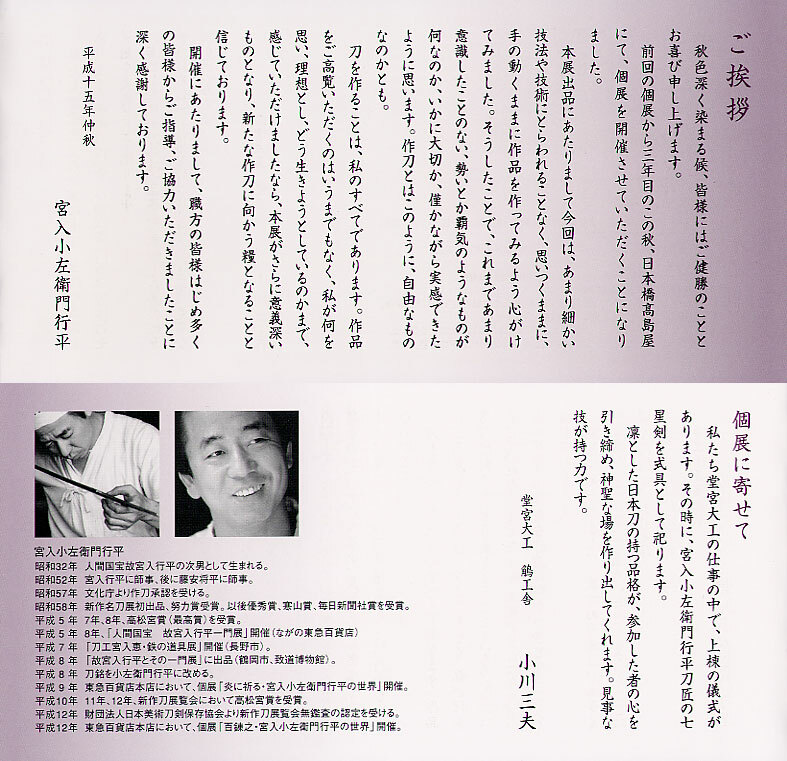 1993　Participated in "Shinsaku To Tenrankai" and received a "Takamatsunomiya-sho". (the highest prize given a name of imperial family). 1994　Participated in "Shinsaku To Tenrankai" and chosen for the finalselection. 1995・96・98　Participated in "Shinsaku To Tenrankai" and received a "Takamatsunomiya-sho". 1997　Participated in "1997 Shinsaku To Tenrankai" and received a "Yushu-sho". 1999・2000　Participated in "Shinsaku To Tenrankai" and received a "Takamatsunomiya-sho".